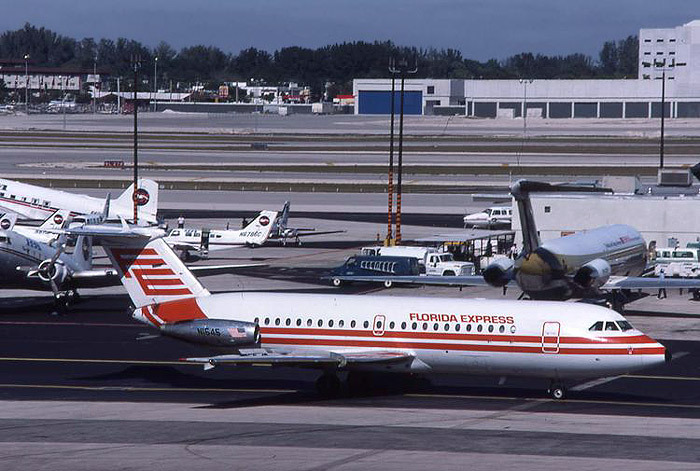 Florida Express was a low-fare jet airline based in Orlando that served points in Florida, the midwest, and the mid-Atlantic states. The airline began operations in January 1984 with a fleet of BAC 1-11s. Braniff (II) absorbed Florida Express in 1988, bringing the return of some of the same BAC 1-11s that had flown with the original Braniff two decades earlier. Below: Glory days at Miami: Florida Express BAC 1-11 N1545 taxis past several PBA aircraft in this fantastic shot from January 1985. This aircraft originally flew with Braniff and then with Allegheny and USAir. With the merger, it returned to Braniff in 1988. A ticket jacket from 1984 showing the Florida Express route map. For additional timetable images and information, visit the Florida Express page at Timetable Images.